When the world started to go to hell in a handbasket newly divorced Mortimer Tate headed for the hills in Tennessee and a well stocked cave. Nine years later, after spotting three men hunting, he ventures out intent on finding out what happened to the world and his ex-wife. What he finds is a society divided into clans and regressed into the pioneer territory of the wild west. After being rescued from the clutches of a mad man by a clone of Buffalo Bill, Tate is directed to a Joey Armageddon’s Sassy-Go-Go bar, a kind of cross between a saloon, bordello and trading store, where he swaps some of his stockpiled goods for Armageddon dollars. He discovers that after the apocalypse his ex-wife had become a stripper at the club and had been traded to another venue. Using his new dollars he sets off after her with his new sidekick, navigating through a treacherous landscape where there is no law, only the vestiges of some ancient decency and the power of dollars and guns. 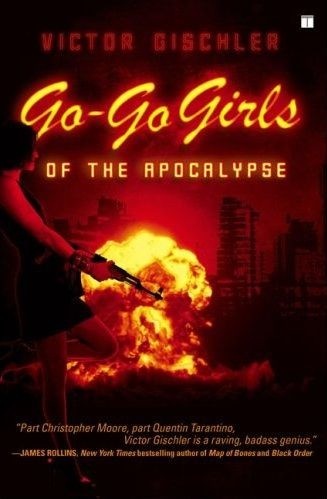 The Go-Go Girls of the Apocalypse is best taken for what it is, a slice of fun, often cartoonish and violent, apocalyptic noir. Think of it as a summer action movie, not an art-house film. The plot just about hangs together, although it sometimes uneven and teeters on the edge of collapse, the prose is workmanlike and the characterisation a little thin, but the pace and energy keeps the tale moving forward through a series of trials for Mortimer Tate, his sidekick, Buffalo Bill, and tag-along stripper, Sheila. Moreover, Gischler does conjure up a reasonably coherent vision of a post-apocalyptic society that is part Mad Max and part Wild West. 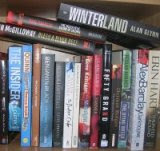 Taken on those terms, the book is an entertaining and enjoyable escapist yarn.